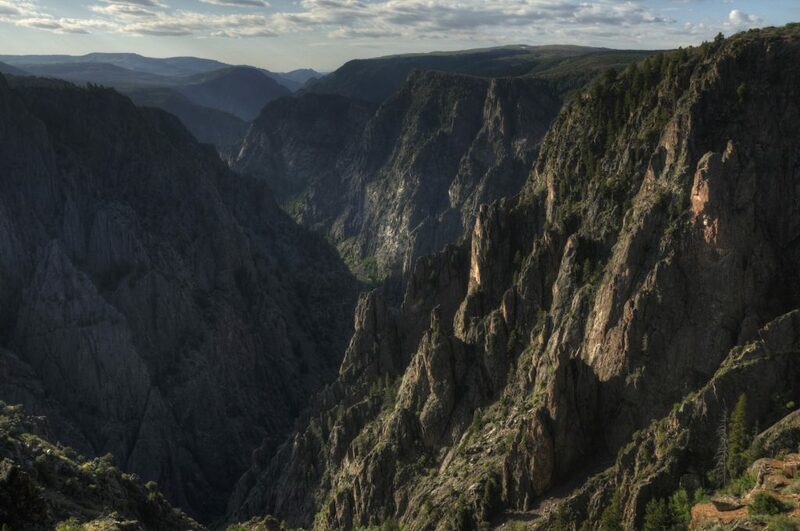 I spent the better part of two days in Black Canyon of the Gunnison as the last stop on a tour of southern Colorado National Parks. It was my favorite spot along the trip because it was visually spectacular, it is a straightforward park with mostly obvious options of what to do, and there were very few people. I spent the majority of my time moving from overlook to overlook taking photos and videos. There are a couple easily manageable hikes. I passed on the more strenuous hike down into the canyon. That would have taken most of another day. Overall, I felt like two days was enough to experience the North and South rims of the canyon. The drive to get from one side to the other is very long. You likely wouldn’t pop from one side to the other then back. I spent one day on the South Rim and camped in the park before driving to the North Rim and spending a night in hotel in Delta, CO.
Black Canyon park is pretty simple. You have the South Rim, where most of the action is at and the more remote North Rim. Though they’re only a few hundred yards apart, if you don’t have the ability to fly, it’ll take you almost 2 hours to drive from the South Rim to the North. For the more adventurous, there is also the possibility to descend into the canyon. I did not do that. I visited the park in May, on a weekday, just before Memorial Day weekend. The park was virtually empty. I ran into one or two people at each of the overlooks, but for the most part, it felt open and free. The beauty of a canyon is that, even if it is packed, if you find yourself a spot close to the edge (but not too close), you can still get an unobstructed view. The weather was about as perfect as it gets for me. It was 70 during the day, in the 50’s at night, and most importantly, I got the type of clouds that I always hope for when I go out to take photos. So this average temperature graph tool I created served me well on this trip. I spent two nights in and around the park. 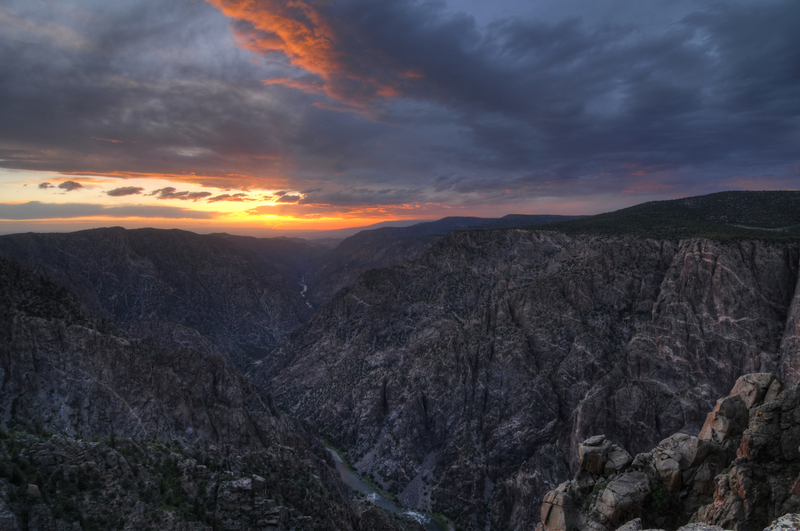 The first night, I stayed in the campground on the South Rim of the Black Canyon. It is well-placed in the park if you’re looking to get up to take sunrise photos or don’t want to drive a long way after taking sunset shots. I did both of those things and it was nice to drive 5 minutes to the campground instead of 30+ minutes to Montrose. It is a no frills campground. You get an electric hookup, but no showers. You can make reservations on Recreation.gov. I made my reservations well in advance, but the campground was far from full when I went. The second night, I stayed in Delta which is well away from the park. I planned on going to the North Rim in the early morning and Delta seemed like a good balance of distance and ability to get a cheap hotel. I stayed at the Comfort Inn there and it was spectacular after having camped the previous few nights. There wasn’t much for food inside the park. If you are camping in the park you could head to Montrose for a restaurant meal, but it would be a better use of your time to pack some groceries. That’s what I did. The roads up to the park are long, dark, and twisting. Better to not drive those over and over again if you don’t have to. 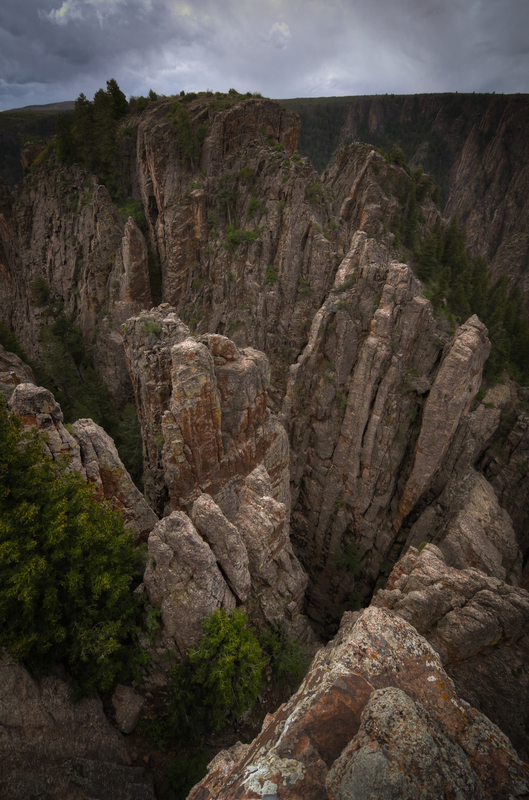 I was in the area of Black Canyon of the Gunnison for about 48 hours. I drove up from Mesa Verde one morning, stayed the rest of that day and another day, stayed the night in Delta, then headed to Denver. I didn’t feel that there was any downtime either. There was plenty to see. I visited some of the overlooks several times in order to get photos with different light, but the experience felt different enough that it was worth the time. I woke up before sunrise in Mesa Verde and broke down my campsite as the sun came up. It took me about 4.5 hours to make the 3 hour drive to Black Canyon because I stopped several times to view the scenery. It is a beautiful drive. I took a route through Cortez, Telluride, and Montrose. I arrived at the park around 11 a.m. and immediately began doing what most visitors do; driving the South Rim Road and stopping at each of the overlooks. My plan was to photograph and take video at each of the overlooks and then assemble them into a YouTube video, but the video quality was low so I ended up passing on that. Unfortunately, I didn’t realize how poor my videography skills were until I got home so I spent a lot of time taking video that would have been better spent soaking in the surroundings. The first overlook in the park is Tomichi Point. It is a fantastic introduction to the park. You get a sense of how immense the canyon is and it gets you excited to see more; and there is more. From there, I stopped at the Visitor Center and Gunnison Point. I inquired about getting a backcountry pass to climb down into the canyon. The ranger adequately discouraged me from attempting it. I could have done it, but it would have taken more time than I wanted to devote to it. That was one of my bigger regrets from my visit. After the visitor center, I continued my drive along the South Rim Road, stopping at Pulpit Rock, Cross Fissure, Rock Point, Devil’s Lookout, Chasm View, Painted Wall View, Cedar Point, Dragon Point, Sunset View, and High Point. At each one, I broke out the GoPro, walked the short trail, and snapped some photos from the overlook. The South Rim Road ends in a turnabout at High Point, but I took a hike on the 1.5 mile out-and-back Warner Point Trail. It is a nice hike. Some up and down, but reasonable, even for someone used to sea-level air like myself. I highly recommend it. The trail not only gives you some new views into the canyon, it lets you see outward. Even though I had driven up a long twisting road to get into the park, I didn’t realize how high the park is. The bottom of the canyon, hundreds of feet below, is roughly the same elevation as the surrounding area. After stopping at each of the overlooks, I went to the South Rim Campground to set up my campsite. After some dinner, I started to drive the South Rim Road again, this time stopping at the overlooks to get timelapse videos. They didn’t turn out either which is a shame because each set of photos represented about 15-20 minutes of time. 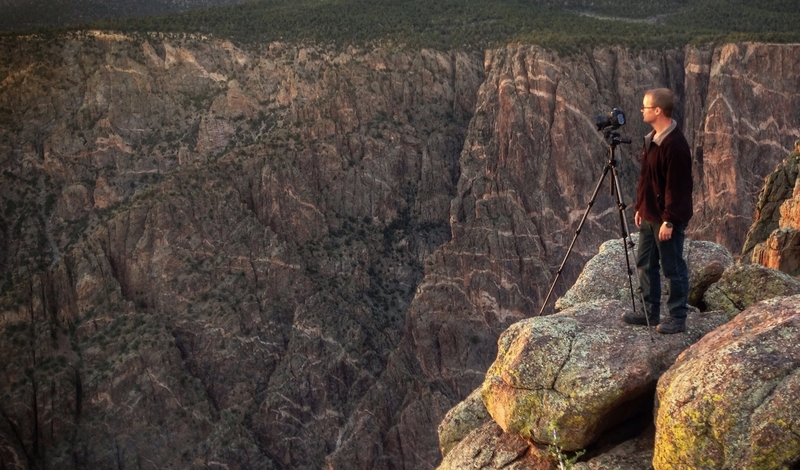 At least when shooting a timelapse video there is plenty of time to enjoy just being there. By the time I was done with that it was getting close to sunset. I had decided earlier in the day that I would spend the sunset at Cedar Point Overlook which has a great view of the Painted Wall and it seemed like it would be less busy. I set up and spent about 30 minutes there before I realized the sun was going to set behind a curve in the canyon. So I ran (actually ran) back to my car and drove a bit further down to the appropriately named Sunset View Overlook and that’s where I spent the rest of my evening. This was one of the few nights I had on the trip with great clouds around sunset so I soaked it in. I woke up before sunrise the next morning and tried to find an overlook where the canyon would line up with the rising sun. I wanted to get a shot along the canyon with the colorful clouds. The canyon twists and turns throughout the park, but I couldn’t find a spot since the sun was rising so far North on the horizon in late May. So I went to the Painted Wall Overlook where the sun would be behind me in the hopes of catching the early, colorful rays of light as they hit the canyon wall. I then turned back and headed for Tomichi Point where the sun was casting really harsh shadows over one wall of the canyon. 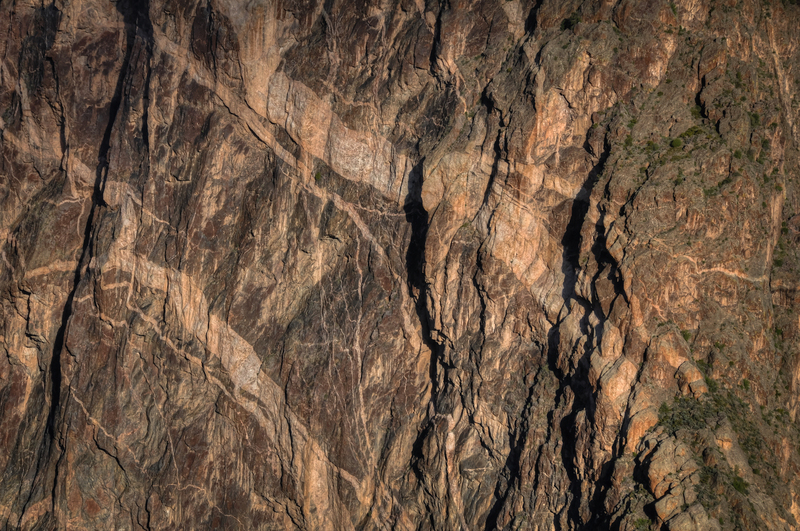 These shadows are where the Black Canyon gets it’s name, so I wanted to try to capture that. After that, I broke down my campsite and started the long, long drive to the North Rim of the canyon; about 2 hours. There are some interesting sites along the way, but it was uneventful. You drive a lot of gravel roads, including the North Rim Road. On the North Rim, I did the same thing as the South Rim, drove to each of the overlooks. I stopped at The Narrows, Balanced Rock, Big Island, Island Peaks, and Kneeling Camel Views. 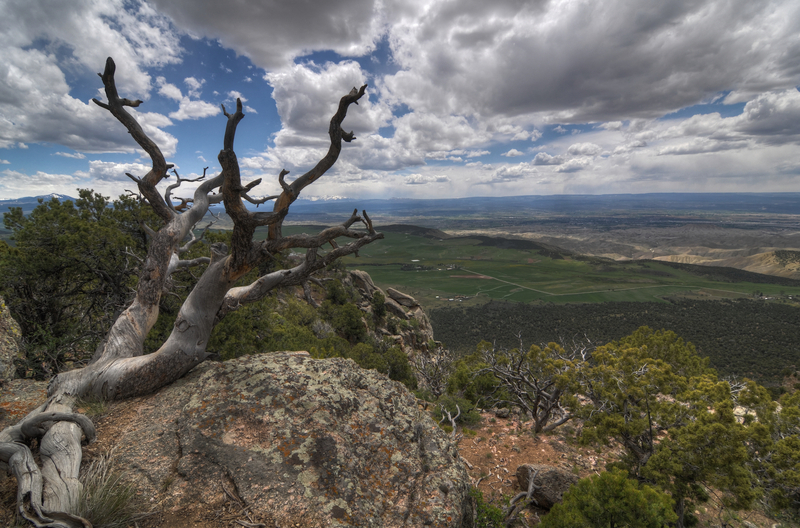 The overlooks on the North Rim are more rustic than their South Rim counterparts. Sometimes there was a fence to keep people from falling over, but they weren’t as well maintained. The traffic on the North Rim is much, much lower. In the 2 hours that I spent there, I saw two cars on the road, but no people. I decided to call it an early day and went back to my hotel in Delta, CO. I spent the rest of the day relaxing, cleaning up my camping gear, and preparing for the trip home. Before I made the trip, I had planned on visiting the North Rim for sunrise before heading back to Denver. 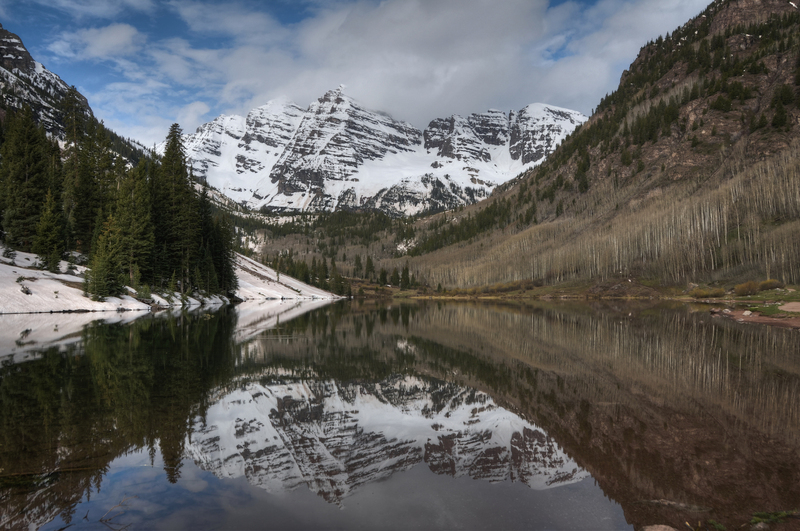 Since I felt like I got my fill of it on Day 2, I spent sunrise driving to the Maroon Bells. I arrived there a bit after sunrise, but just as the sun was clearing the mountains and the water was perfectly still. This photo isn’t in Black Canyon, but I wanted to share it somewhere. I would hike down into the canyon. As strenuous and time-consuming as it would have been, I would have loved to come away with some photos viewing the canyon from the opposite direction; that is, from the bottom up. If the right lighting conditions presented themselves, those photos would be spectacular I think. The one area of the park that I was most excited to see was The Painted Wall. Before going, I had seen dozens of different compositions from wide to narrow and I wanted to try all of them…and for the most part, I did. The shot I most wanted was a texture shot. A close-up showing the unique patterns in the wall. I shot a number of them, but never got the shot I was hoping for. I have enjoyed this one as a desktop wallpaper though. Black Canyon of the Gunnison National Park on NPS.gov – Get information straight from the people who know best. 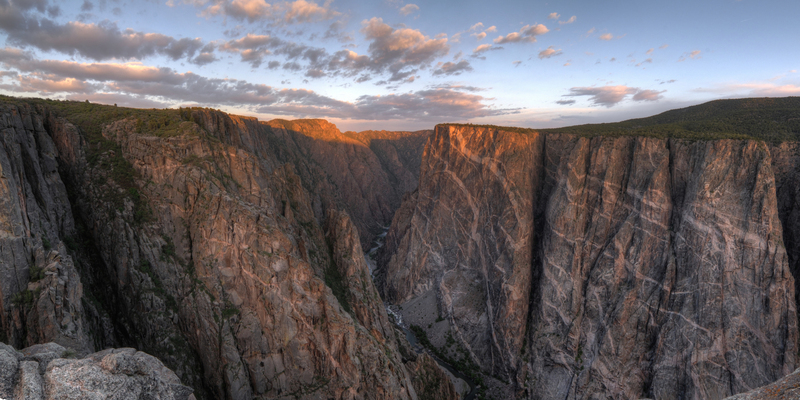 My Black Canyon of the Gunnison National Park Gallery on Flickr – A collection of my photos from this trip on Flickr.